Writing an artist bio feels like a forced assignment by a grade 2 teacher on a kid who just wants to play. The only problem is that playing alone doesn’t get one very far and at a point you have to get to the important stuff that just doesn’t feel like a holiday in Hawaii. Over the weekend I stumbled upon an article about biographies that got me reviewing my sorry excuse for a tell the world about you –biography, which was nothing more than a glorified resume with a bit more text. I hadn’t realized yet that this affected my branding. So I got around to making notes and working on them and I now have a short and medium bio I want you to check out. I will work on the long one this week and send it to you as well. Whoever said Hip Hop was dead went to the wrong funeral and never gave Hondred Percent a thought. Hondred Percent expresses the raw humor and experiences of the Ghanaian lifestyle through authentic spoken word and rap. With inspiration from Biggie Smalls, Jay-Z, Missy Elliot, Reggie Rockstone, Saul Williams, Common, Mos Def, Timbaland, Kanye West and Kevin Hart, Hondred Percent has created a distinct sound that can only be compared to Ghana jollof. A Manifest (Ghana) and Blitz Da Ambassador (Ghana) fusion or Tumi (South Africa) and HHP (South Africa) rolled in one, jamming to sounds from the Roots (USA) gives a hint to the sound, word play and realness that Hondred Percent brings to the stage. The two time Ehalakasa Slam Champion (2014-2015) is set to release his debut album “WTF?” in June 2017. It is spicy Ghanaian black pepper poetry bumping to Hip Hop music. Hondred Percent aka Paul Forjoe jnr is a rising spoken word artist from Ghana who burst on the scene in 2011 fusing poetry and rap to make Hip Hop music. Hondred Percent is set to release his debut Hip Hop album “WTF?” in June 2017. He is currently working on a video for a single in the album and releasing his second single “Poet Rapper”. Hondred Percent in 2014 and 2015 triumphed as the overall winner of the Ehalakasa Slam in which over 40 poets in Ghana contested. While in Form 3 (Grade 9) in the early 90’s, Hondred Percent got introduced to rap and started writing poetry. It was his varsity days in South Africa that exposed him to Spoken Word and got him performing. He came up with the name Hondred Percent in 2010 as a way to distinguish and motivate himself in his passion on his return to Ghana. 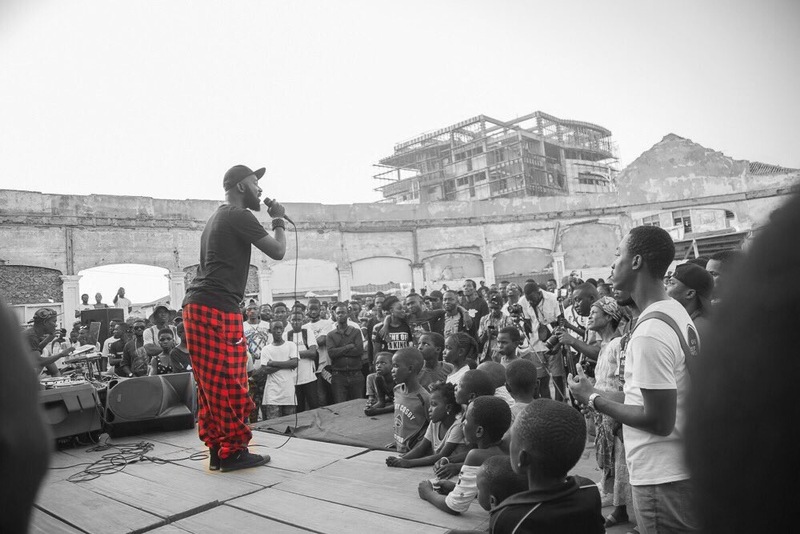 He has since performed at numerous events within Ghana and recently traveled to Kenya to feature as a guest artist on a French show and a Slam at Alliance Francais Nairobi. He is inspired by Biggie Smalls, Jay-Z, Missy Elliot, Reggie Rockstone, Saul Williams, Common, Mos Def, Timbaland, Kanye West and Kevin Hart. He has been compared to Manifest (Ghana) and Blitz Da Ambassador (Ghana) by some. Hondred Percent is however trying to tap into the essence of Tumi (South Africa) and HHP (South Africa) bumping to the Roots (USA). The artist has made quite a name for himself as a prolific wordsmith within Ghana. He plans to release his album for free as means to grow his fan base and crowd fund for the next album set for 2018. There are also plans to put together a band by the end of 2017 to enable him tour Ghana, Africa and the World. Keep it One HONDRED! and let me know what you think. Later in the year I will probably put together a workshop to help others see the importance of bios and branding. Look out for it. Previous PostPrevious Will I Ever Get To The VGMA?